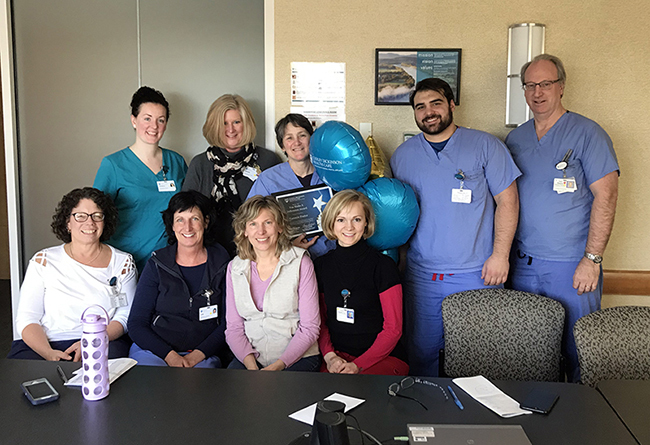 North 3 Patient Care Associate Skarlleth Kauffmann is the winner of the March You Make A Difference Award because of her kindness and dedication to Cooley Dickinson patients. Nurse Manager Nicole Fisette says that Skarlleth’s coworkers describe her as someone who is “gentle, conscientious, and a pleasure to work with.” She is known to use her own form of medicine—humor, laughter, and the ability to be in the moment—to craft experiences for her patients that exceed typical expectations for a hospital stay. One example of her commitment to patient experience and well-being happened when she found out that a patient was just a few days away from celebrating a milestone wedding anniversary. Skarlleth talked with the patient about writing a love letter to their spouse, and provided them with pen and paper. That might be enough for some, but not for Skarlleth, who found out the couple’s wedding song, and talked a friend into learning to play the song. She picked up a bouquet of roses and an anniversary card, and arranged for a sweet, kind-hearted surprise. The patient’s spouse and family arrived for a visit and were serenaded with an impromptu performance and celebration as they walked into the room. Thank you Skarlleth, for putting our patients first! You Make A Difference! 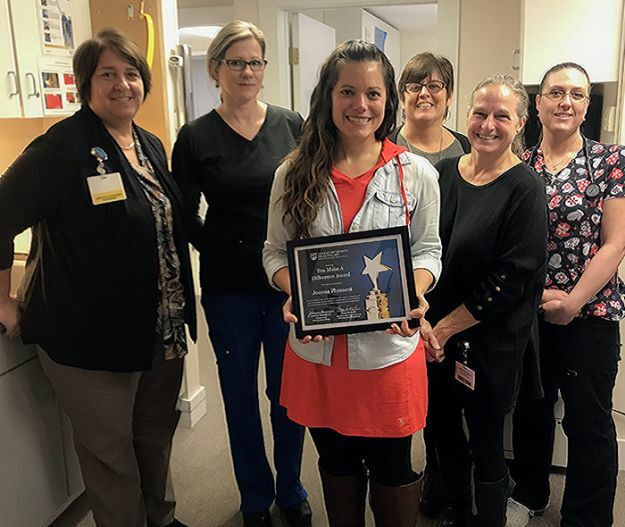 Occupational Therapist Tammie Foster is the February winner of the You Make A Difference Award because of her dedication to the well-being of Cooley Dickinson patients. 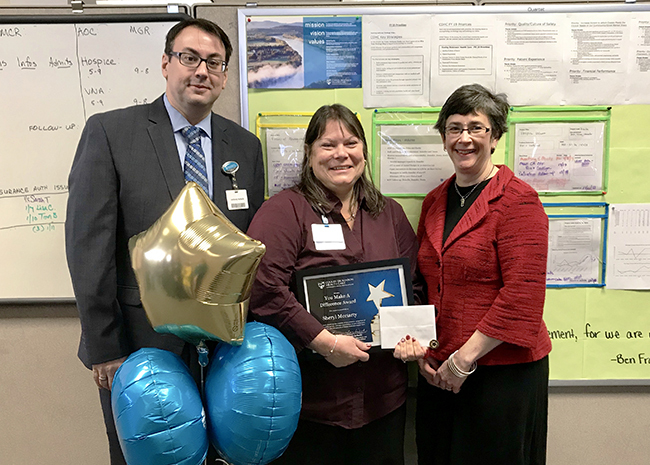 Several of Tammie’s nominators shared that Tammie has gone above and beyond for a patient or coworker, including times she has stepped in to cover for someone who was out sick or has driven to more distant offices to help a patient in need. One particular story stands out. When Tammie was leaving work one day, she happened upon a patient who was being discharged and waiting for a cab. Tammie was worried that the patient was not well enough to be discharged, so she took the time to stop, take vitals, and reach out to nursing and transport staff. Tammie followed the patient home to make sure they were able to get home safely. The patient was later readmitted. Tammie trusts in her good instincts and skills, which makes a difference for all of our patients. Tammie demonstrates all the values of Cooley Dickinson: Quality, Compassion, Collaboration, Respect, and Integrity. Thank you, Tammie, for being an inspiration to all of us at Cooley Dickinson. You Make A Difference! Sheryl Moriarty has been part of the team at the VNAH for over 20 years and has never let her commitment to quality patient care slip below anything less than her number one priority. Currently the VNAH’s Clinical Support & Education Nurse, she sets the bar high for herself and her coworkers and then continues to raise it. That is why Sheryl is the January recipient of the You Make A Difference Award. Sheryl is someone who is not intimidated by change – in fact, it inspires and motivates her to step up and take more responsibility. She takes charge of ensuring excellent patient care and is able to address issues with swift precision and, most importantly, empathy. She makes a habit of discussing concerns with every single nurse, and this has led not only to a boost in morale, but also to cost savings by optimizing how we use supplies. Her collaborative spirit makes everyone accountable for continuously improving the care that we deliver. Sheryl truly makes a difference in our patients’ lives, and the lives of her coworkers every single day. 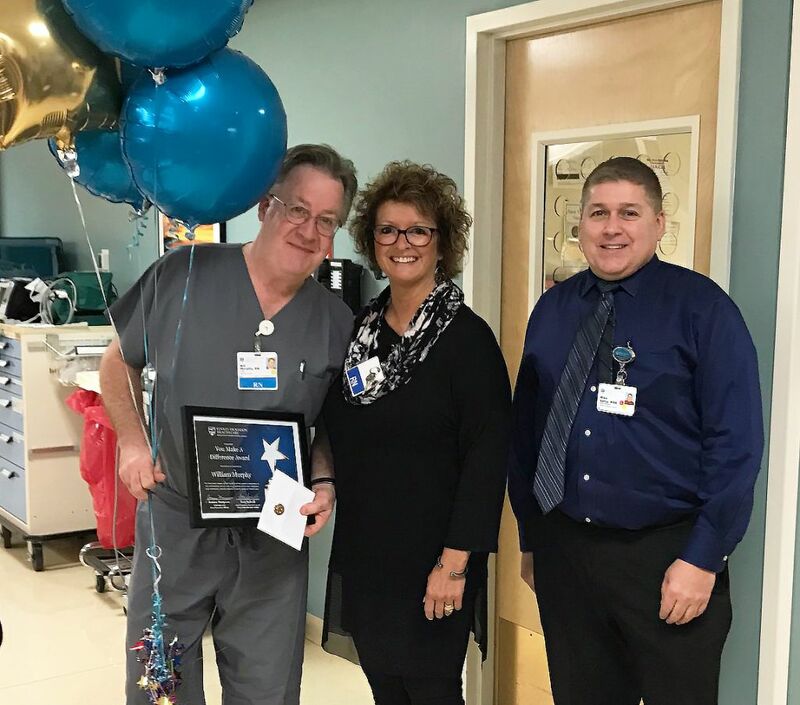 Bill Murphy has been an RN at Cooley Dickinson for over 31 years and we are very fortunate to have him as part of our team. 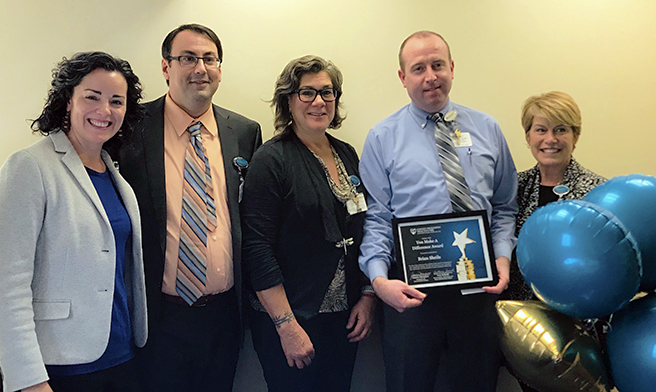 Bill is tremendously respected by patients and by his peers, and that is why he is the December recipient of the You Make A Difference Award. 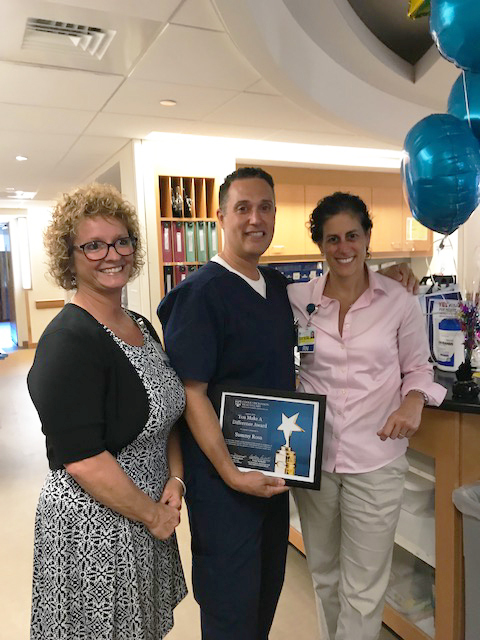 Bill receives a substantial number of thank-you letters and cards from patients due to his exceptional clinical skills and the relationships that he is able to form with patients and their families. In a recent thank-you note, a patient’s spouse wrote about how scary it was to wait alone in the ED during a procedure, that is, until Bill brought in a cup of tea and a warm smile. Bill not only demonstrates the high quality of care we expect at Cooley Dickinson, he coaches his coworkers and advocates for better care as part of his daily routine. His actions speak volumes, and we are proud of all that he has accomplished. 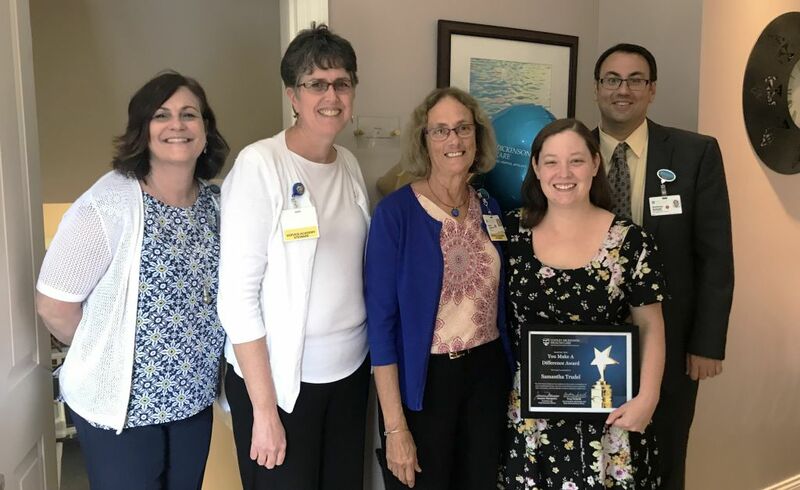 Williamsburg Internal Medicine Nurse Practitioner Joanna Pheasant inspires her coworkers with the level of kindness and care she gives every day and exemplifies Cooley Dickinson values by demonstrating compassion and showing respect for her patients and coworkers. That is why Joanna is the November recipient of the You Make A Difference Award. Williamsburg’s practice is growing every day, and as workloads have increased, Joanna has continued to support the practice by providing walk-in care to patients-which is not an easy balancing act. 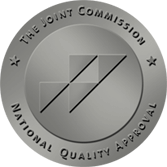 Many of her patients have complicated and challenging needs, and Joanna steps up to provide them all with compassionate and personalized care. She always takes the time to explain a diagnosis and set treatment expectations in a way that makes her patients empowered and informed participants in achieving their health goals. Brian is an invaluable member of the Cooley Dickinson Performance Improvement Team, and a data investigation prodigy. Brian LEANs in to challenges and upholds the quality of care at Cooley Dickinson by maintaining our data and systems and collaborating across the organization to provide creative solutions to complex situations. He took the initiative to really get to know the data streams in EPIC and taught himself how to use the reporting and dashboard functions—now he is the expert. He has uncovered and brought attention to lost work-queues and is dedicated to improving quality of care for our patients. Brian is also known to excel at coaching staff in a respectful and highly effective way to work through problems and improve productivity. Samantha Trudel is the September winner of the You Make A Difference Award at Cooley Dickinson. 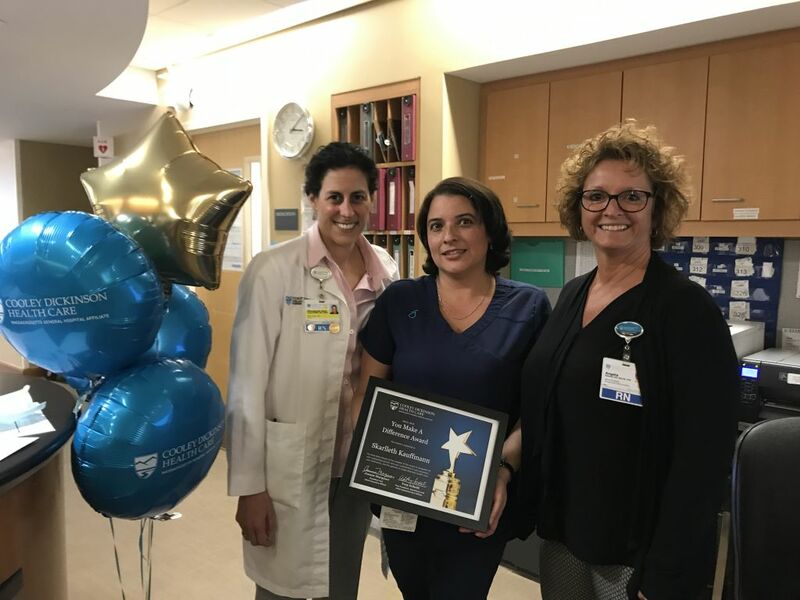 Sam received multiple nominations from her coworkers in Women’s Health because of her commitment to making every patient interaction welcoming and special. Sam has been with Cooley Dickinson for 5 years and has been working hard at making a difference for both coworkers and patients since her very first day. She is known for bringing great ideas and enthusiasm to her work, and for living the Cooley Dickinson values of Integrity, Compassion, Collaboration, Respect, and Quality. Tanya Roy had this to say about Sam: “She is compassionate with patients, co-workers, and every person she meets. Sam is caring, hard-working, and always willing to go above and beyond”. Congratulations Samantha. You Make A Difference! Sammy Rosa is the first winner of the new You Make A Difference Award at Cooley Dickinson. His coworkers on the evening shift on North 3 know him as an exceptional Patient Care Associate who has a talent for making meaningful connections with the patients he serves every day. No matter what a patient needs, Sammy always demonstrates compassion and acts with integrity. Sammy has been with Cooley Dickinson for 15 years and has never passed a day without bringing his big smile and upbeat personality to work with him. You can tell that he is making a difference by the easy conversations and laughter that float out into the hallway whenever he is in the room.